Shirdi Sai Devotee Shilpa from Doha says : Om Sai Ram! My name is Shilpa Pasricha and I am from Doha and I am the member of MP 129-Rajni Sai . I had many good experiences during the Mahaparayan but I would like to share the experience of 5th April 2018 that’s on Last Thursday. In the morning as usual my husband and kids left for their office and school and just after 10 minutes I got a call from my husband which was missed by me. After 1 hour I called him back and he told me that he met with an accident. Somebody crossed the red light and hit my husband’s car. It hit on the driver’s seat very brutally and because of the accident both the airbags opened and the front wheel was damaged. I am really thankful and grateful to Sai Babaji for saving my husband’s life from this horrible accident. And we had also not been told to pay a huge amount of fine. All thanks to Sai Baba ji! 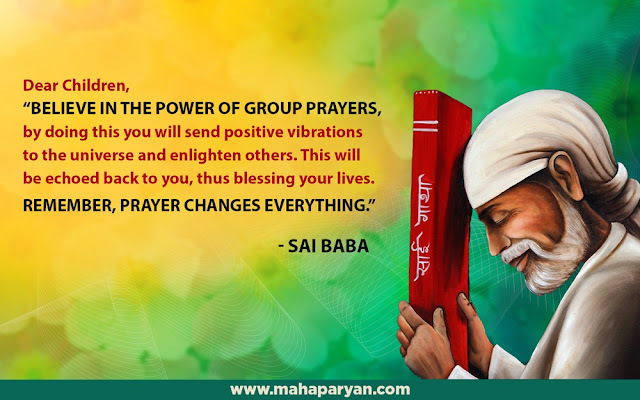 Sai Maa is the most merciful and benevolent for His children than anyone. He always sees to it that His devotees are not harmed in the best possible way. We should be thankful to the destiny that we have been chosen by Baba as His devotees. None can equal His love and care. Love You Sai Maa. Jai Jai Ho Sai..!